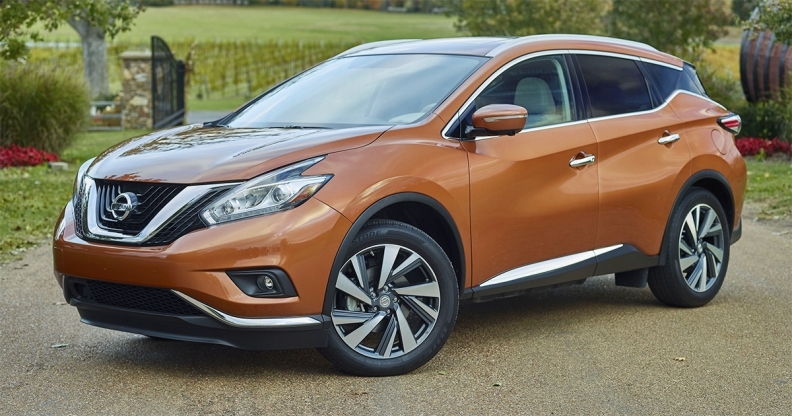 The Murano crossover is part of the recall, for the 2015-17 model years. Nissan Motor Co. is recalling about 134,000 late-model cars, mainly in the United States and Canada, because a fluid leak in the braking system could lead to a fire, the company and U.S. regulators said today. No one has been injured due to the potential defect but several incidents were reported to Nissan of "thermal damage" to vehicles that could include some fires, a Nissan spokesman said. Models involved are certain 2016-2017 Maxima sedans, 2015-2017 Murano crossovers, and 2015-2016 Murano Hybrid crossovers. Drivers are advised that if they notice the anti-lock brake system (ABS) warning light on the dashboard illuminated, they should stop driving the car immediately, park it outside, and call Nissan. A tow truck will be summoned to bring the vehicle to a dealership for inspection, a Nissan spokesman said. "A brake fluid leak onto the circuit board will result in an electrical short, increasing the risk of a fire," said a report posted today by the National Highway Traffic Safety Administration. Nissan told NHTSA that the issue of possibly defective seals stems from a third-tier supplier. About 120,000 of the vehicles to be recalled are registered in the United States, about 11,000 in Canada and the remainder in a handful of international markets, Nissan said. Nissan will replace parts of the braking system if upon inspection the parts are found to be defective, the company said.